Conversational user interfaces and voice assistants are becoming more commonplace. Brands such as Amazon, Google, and Facebook are fueling this trend as they compete for market share. Voice interfaces are advancing at an exponential rate in industries of all kinds, ranging from healthcare to banking, as companies are racing to be part of this revolution. What’s Causing the Shift Towards Voice? Why Adopt A Mobile Voice Strategy? Apple’s Siri, Google’s Assistant, Microsoft’s Cortana, Amazon’s Alexa. These are all ways in which the large brands are investing in voice technology. From the smart home to the smartphone, there are numerous applications of this technology. According to Adobe Analytics, 71% of owners of smart speakers like Amazon Echo and Google Home use voice assistants at least daily, and 44% using them multiple times a day. Over 76% of smart speaker owners increased their usage of voice assistants in the last year. Voice-enabled apps are also becoming a prevalent part of our everyday lives, changing the way brands and consumers interact. In fact, the number of use cases for voice-enabled apps is increasing every single day. In fact, just last month, Google launched a new Android app, Voice Access, that helps people with mobility and motor impairments control their devices. With this app, users can get more specific with their controls, such as being able to use their voice to tap buttons or adjust controls and navigate within apps. Applications of this technology are seen everywhere, so where will it take us in 2019 and beyond? We provide a high-level overview of the potential that voice has and 7 key predictions we think will take off in the coming years. The last few years have been about what the user is saying, and now it will be more about why and where they are saying it. Contextual understanding is the next step for voice in order for it to become an integral part of consumers’ lives. Users want to feel like they’re getting a personalized experience when they interact with technology, specifically voice. Personalization is particularly important in this area as there have been many friction points with voice technology in the past. If we are going to experience more widespread adoption of this technology, it must provide a tailored experience, which is exactly what we’ll see in 2019. Many digital assistants on the market today are lacking contextual knowledge which puts Google ahead of the competition, even with Amazon dominating over 70% of the market. Personalized responses will definitely be a large focus in the coming year. Voice assistants will also continue to offer more individualized experiences as they get better at differentiating between voices. Last year, Google announced that their Assistant on Google Home is able to support up to six user accounts and detect unique voices, which allows Google Home users to customize many features. Users can ask “What’s on my calendar today?” and even “Tell me about my day?” and the assistant will dictate commute, weather, and news information that is tailored for each user. It also includes features such as nicknames, work locations, payment information, and linked accounts such as Google Play, Spotify, and Netflix. Amazon fought to catch up as the company announced customized voice detection for more individualized experiences just a few months ago. Now with a myriad of systems competing for attention and new players in the game with every passing day, app developers will have to manage the fragmentation and complexity of developing apps across multiple platforms and channels. However, it’s not just developers that need to address the complexity of developing for voice as brands also need to understand the capabilities of each device and integration and if it makes sense for their specific brand. They will also need to focus on maintaining a user experience that is consistent within the coming years as complexity becomes more of a concern. One area where we will see voice-enabled devices really take off will be in the automotive industry and in-car speech recognition. In 2018 it became a standard feature for many automotive brands and we’ll see this advance in the coming year. People will be able to do more on their drives to work. As a testament to this, DriveSafe.ly is a great example of an app that encourages safe driving so users can keep their eyes off their phones. Voice search has been a hot topic of discussion. Visibility of voice will undoubtedly be a challenge. This is because the visual interface with voice assistants is missing. Users simply cannot see or touch a voice interface unless it is connected to the Alexa or Google Assistant app. Search behaviors, in turn, will see a big change. In fact, if Juniper’s predictions prove correct, voice-based ad revenue could reach $19 billion by 2022, thanks in large part to the growth of voice search apps on mobile devices. Brands are now experiencing a shift in which touchpoints are transforming to listening points, and organic search will be the main way in which brands have visibility. comScore data even reveals that 50% of all search will be via voice tech by 2020. As voice search grows in popularity, advertising agencies and marketers expect Google and Amazon will open their platforms to additional forms of paid messages. In terms of mobile app marketing, voice raises a new challenge- user engagement and retention. Developers will need to find ways to capture and maintain their users’ attention by giving them a push to continue using the app. In September, Amazon added a notification capability to the Amazon Voice Services API. The Notifications feature allows Alexa to proactively indicate that there is new content from core features, such as Shopping updates, and Alexa skills. Urban Airship has also announced their voice push notification services. CES 2018 proved that voice and displays are merging into one seamless experience. Google showcased their assistant with the Lenovo screen display. In fact, Google’s CES 2018 installation housed hundred of other devices showcasing the Google Assistant, many of which were screen displays so users could further interact with the assistant. This year, voice payments will become more secure and convenient for users to make voice payments. Users are increasingly aware and familiar with concerns around their smart home devices. With so many devices in the space of our own home, it’s more important than ever to keep information private. Privacy and security need to be a focus as voice makes its way to mainstream, entering the homes of millions more. Voice payments, in particular, will become more secure and convenient for users to make purchases. Speaker verification and ID will become paramount as part of the voice assistant experience with more security being built around the user. The main driver of this shift toward voice user interfaces are the changing user demands. There is an increased overall awareness and a higher level of comfort demonstrated specifically by millennial consumers. In this ever-evolving digital world where speed, efficiency, and convenience are constantly being optimized. The mass adoption of artificial intelligence in users’ everyday lives is also fueling the shift towards voice. The number of IoT devices such as smart thermostats and speakers are giving voice assistants more utility in a connected users life. Smart speakers are the number one way we are seeing voice being used, however, it only starts there. Many industry experts even predict that nearly every application will integrate voice technology in some way in the next 5 years. Mobile phones are already personalized, more so than any website. Additionally, there is very little screen space on mobile, making it more difficult for users to search, or navigate. With larger product directories and more information, voice enables consumers to use natural language to eliminate or reduce the manual effort, making it a lot faster to accomplish tasks. Comcast brought voice search to their remotes to allow Xfinitity customers to quickly browse and find their favorite shows or the latest movies with certain keywords, for example, an actresses name. Brands need to focus on better mobile experiences for their consumers and voice is the way to do so. Users are searching for quicker and more efficient ways of accomplishing tasks and voice is quickly becoming the ideal channel for this. Whether that’s finding out information, making a purchase, or achieving a task, voice is the new mobile experience. It’s clear that brands are racing to figure out their voice strategy. With over 10 million voice-activated digital assistants that have been sold already, there’s a reason why this is. Voice technology is becoming increasingly accessible to developers. For example, Amazon offers Transcribe, an automatic speech recognition (ASR) service that enables developers to add speech-to-text capability to their applications. Once the voice capability is integrated into the application, users can analyze audio files and in return, receive a text file of the transcribed speech. 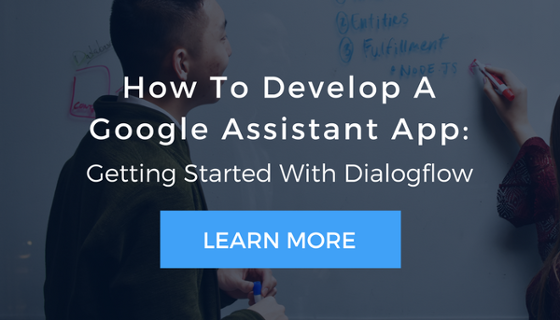 Google has made moves in making Assistant more ubiquitous by opening the software development kit through Actions, which allows developers to build voice into their own products that support artificial intelligence. Another one of Google’s speech-recognition products is the AI-driven Cloud Speech-to-Text tool which enables developers to convert audio to text through deep learning neural network algorithms. And this is only the beginning for voice technology as we will see major advancements in the user interface in the years to come. With the advancements in VUI, companies need to start educating themselves on how they can best leverage voice to better interact with their customers. It’s important to ask what the value of adding voice will be as it doesn’t always make sense for every brand to adopt. How can you provide value to your customers? How are you solving their pain points with voice? Will voice enhance the user experience or frustrate the user? In 2019, voice-enabled apps will start to understand not just what we are saying, but how we are saying it and the context in which the inquiry is made. However, there are still a number of barriers that need to be overcome before voice will see mass adoption. Technological advances are making voice assistants more capable particularly in AI, natural language processing (NLP), and machine learning. To build a robust speech recognition experience, the artificial intelligence behind it has to become better at handling challenges such as accents and background noise. And as consumers are becoming increasingly more comfortable and reliant upon using voice to talk to their phones, cars, smart home devices, etc., voice will become a primary interface to the digital world and with it, expertise for voice interface design and voice app development will be in greater demand. Advancements in a number of industries are helping digital voice assistants become more sophisticated and useful for everyday use. Voice has now established itself as the ultimate mobile experience. A lack of skills and knowledge make it particularly hard for companies to adopt a voice strategy. There is a lot of opportunity for much deeper and much more conversational experiences with customers. The question is, is your brand willing to jump on this opportunity?